Eastern side of Naushon Island. Privately owned. Grounds and lighthouse are off limits to the public. However, the Cuttyhunk Historical Society offers an annual tour to the lighthouse each summer. 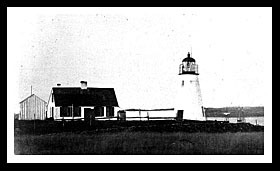 Long before the current Tarpaulin Cove lighthouse was built, an early navigational light was built by a tavern keeper named Zaccheus Lumbert, in 1759, for seamen and local mariners traveling through Vineyard Sound, who would often stop by his tavern on the island for a meal or to stay overnight. This light was considered one of the earliest on the east coast shoreline and was maintained and paid for mostly by Lumbert and those that came after him for nearly six decades. 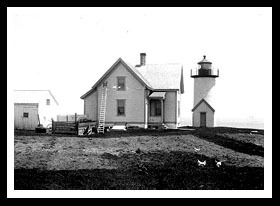 Image Courtesy US Coast Guard When the lighthouse was built in 1817, John Hayden became its first keeper. He had previously serviced the locally constructed lantern at Tarpaulin Cove Lighthouse for over 25 years. Keeper Frank Davis saw the distress signal from the Schooner Tanzy Bitters, which had caught fire and quickly made haste to rescue two men who were badly burned from the incident. As his wife tried to tend to the men, Davis headed out to Martha’s Vineyard to find a doctor. By the time Davis and help had returned, the men had succumbed to their injuries and had died at the keeper’s house. The original tower was replaced and put on higher ground after complaints from the keepers, and a 1,200-pound fog bell was added, which was later swept away during the hurricane of 1938. There are not any designated tours that go past this remote lighthouse, however, some boats leaving out of New Bedford or Woods Hole may provide charter service out to the light. The area is off limits to visitors as it is protected. It remains a private residence. 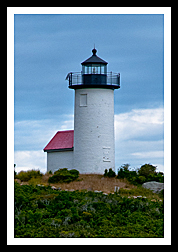 The Cuttyhunk Historical Society offers an annual open house to the lighthouse usually in mid summer. They also staff a maritime museum of the Elizabeth Islands during the summer season. Cuttyhunk Island is the last of the Elizabeth Islands that is mostly accessible to the public, whereas the other islands are private, except Penikese Island. It is a great place to relax and step back in time as little has changed. The Mass Audubon Society provides excursions on Sundays from Wood’s Hole to the Penikese and Cuttyhunk Islands. They offer a full day Penikese/Cuttyhunk dual island tour and a full day Cuttyhunk Tour. Each tour will include naturalist lead excursions for visitors to enjoy these islands unique natural and cultural history. Visitors will discover the abandoned Leper Colony and active bird colonies of Leach’s Storm Petrel and Terns, and the quaint village, harbor, and scenic views from 150’ high Lookout Hill on Cuttyhunk Island.